This week, as Earth Day came and went and I attended a fair here or an Earth celebration there, it also donned on me that Spring is here! So, beyond my environmental excursions, I also attended of variety of events held on my very own Columbia University. Yet, what I found was an inability to fully appreciate some of the events due to the ubiquity of plastic water bottles. Some may laugh, but I find myself becoming more and more annoyed with these obnoxious bottles that I suddenly see everywhere. As I have previously written about bottled water, my awakening began when seeing the movie “Blue Gold: World Water War’s” on instant play on Netflix. Then, I really became irked when seeing “The Story of Bottled Water,” which I posted on this blog. Last week though, I attended another water documentary screening, this one a full length feature exclusively focused on the water bottle industry. Now, the movie does a lot of pointing fingers. Most obviously, the manufacturers, NESTLE, Coca-cola, and Pepsi Co., bear a large portion of the blame. Yet, beyond these stormtroopers, the film also criticizes the manufacturing of plastic bottles, or specifically the type of plastic used for water bottles. Called “PET” or “PETE”, this plastic has traces of all sorts of toxins linked to all kinds of health hazards. The most common and perhaps scariest is the link between the toxins in the plastics and fetal development. You would think the Right-to-Life community would be all over this one? We remember the BPA discovery that destroyed Nalgene and made SIGGs cooler than Uranus, but what we don’t realize is that much of the plastic in your “Poland Spring” “Dasani” “Deer Park” or “Aquafina” contains some trace of BPA, benzene, or some other kind of harmful toxins. Though it seems impossible to escape simply breathing in toxins because of the pollution we all breathe daily, it is more distressing that we choose (most of the time out of ignorance) to put these poisons in our body. And just to reiterate, Dasani and Aquafina are JUST PURIFIED TAP WATER. It is exactly what you drink out of the sink! Only it’s less healthy because there are some other salts and chemicals in it, as well as, whatever has mixed into the water from the plastic bottles. And this is the danger. We don’t know why and how these poisons leak into the water contained in the bottle. Now, we know not to drink a bottle if it has been sitting in your car in the heat, yet none of us know where that bottle came from before we bought in the store. Perhaps it was sitting in a heated area. Or perhaps, simply long liquid exposure with the plastic releases some of the toxins into the water. I don’t know, but either way, tests (from the film) found that the water in plastic water bottles is often highly polluted and/or toxic. So, take all this information and then attend some University events I did this past weekend. Every event had an assortment of drinks, including plastic water bottles. The BBQ on Saturday Afternoon on the South Lawns, in the middle of the heat of the day, had plastic water bottles to drink. So it is obviously much cheaper to have someone refilling the water at your event, then buying bottled water for “convenience” (I’m sure your constituents won’t mind the poison you serve with that “convenient” bottled water). One good thing about Tapped: The Movie was contact it made with another organization – Food and Water Watch – about how to “get off the bottle” and reclaim the TAP. The produced a brochure about how public events can easily be ran without plastic bottled water. The more we refuse to serve it in our public events, the more people will stop using it. Please, if you are reading this and you are organizing an event soon, DON’T BUY PLASTIC BOTTLED WATER. There are other, healthier ways of keeping your peeps refreshed. To read more astonishing facts, here is the No Impact Man’s opinion. I hear you. You might be happy to hear that some universities are taking proactive steps to limit plastic waste, particularly the University of Portland, which recently banned the sale of plastic bottles on campus. Student response has been overwhelmingly positive. Anyone else know of an insitution implementing similar changes? The one thing that I was surprised to see after watching Tapped was that there was no acknowledgment of the issue of Fluoride in our TAP water. Even the Department of Health is claiming that fluoride “has repeatedly been shown to be an effective method of preventing tooth decay,” which is certainly not true in terms of consuming fluoride. It is difficult to uniformly and unconditionally embrace TAP water as long as the government is putting all kinds of weird additives to our water. Laura, you hit the nail on the head. 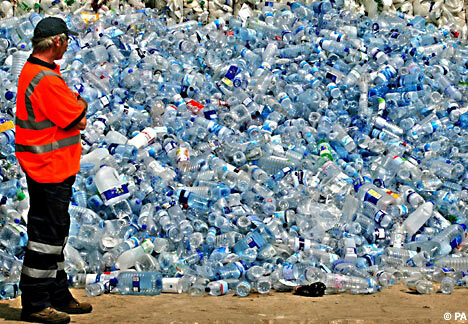 Buying bottled water is extremely wasteful and harmful to the environment. At the same time, however, there are often lots of nasty contaminants in tap water (though not always), including ones that the government put there (like fluoride). I don’t want it to seem as if I’m pushing filters here (I work for a filter company), but the real answer is to test your water and then find a filter that removes whatever contaminants you find. From what I hear, reverse osmosis is the best. And, it is true, but unfortunately we have to turn to filters for the best suited water (if were living in those places where fluoride is in our water). That is a serious Social Problems. Control Optics Taiwan(COT) was established in 1986. We are one of the major manufacturers for optical lenses and components in Taiwan. We mainly produce lenses, prisms, light pipes, filters, integrated lens array (fly’s eye lens), glass plates, windows, and mirrors in optical glass and IR material for industrial, commercial and medical use. We have overwhelming designing and manufacturing capacity for customized optical components, making different optical products from proper kinds of materials to meet customers’ requests. We have a whole set of optical processing equipment such as cutting, grinding, polishing and coating machine. Our products are mainly sold to Europe, America, Southeast Asia, Japan and Taiwan. High quality and short period of delivery is our extinguished advantage. We believe that we will become your reliable supplier and best business partner through our continuous effort. Please contact us at your convenience.